By now you realize I am a fan of Anthony Bourdain, but this past Sunday night I fell even more in love with the man with the salt-and-pepper hair and the year-round tan. Bourdain has traveled to many places even a U.S. drone wouldn’t dare infiltrate. He has showcased cuisine that almost put him in an early grave, but he has never done anything more controversial than what he did during the kickoff episode of the second season of his Emmy award-winning show. Bourdain said the word “Palestine” and he wasn’t even sorry. The episode was titled “Parts Unknown: Jerusalem, West Bank and Gaza.” The fact that neither Palestine nor Israel is mentioned in the title is quite telling. Instead of force-feeding the audience, Bourdain served up something so delicious viewers on either side of the fence couldn't resist digging in. The show kicks off with Tony, who has one Jewish parent and absolutely no faith, visiting the Wailing Wall. He is welcomed with open arms and I believe bar mitzvahed. This fascinated me. Here is Bourdain, with zero connection to Israel, welcome to live in Jerusalem if he chooses while Palestinians living 5 minutes away in Bethlehem are banned from even visiting. While touring the old city, Bourdain's guide Yotam Ottolenghi addresses one of the most controversial questions in the Palestinian/Israeli conflict. Is falafel Israeli and can fried chickpeas have a nationality? Foreshadowing Bourdain’s descent to the Palestinian dark side, Yotam suggests that falafel is more Palestinian than Israeli because the Palestinians have been frying it since before modern-day Israel was even born. Bourdain, who donned a kippah at the top of the episode, passes on placing a crown of thorns on his head lest he muss up his heavenly hair. Anthony Bourdain is known for showcasing things rarely seen on a channel like CNN, like super-hot, mother-of-two racecar driver Betty Saadeh. Betty of "Speed Sisters" fame is Shakira meets Mario Andretti. With Bourdain in the passenger’s seat, she sped through the Ramallah bubble, sporting a fantastic hot pink Bebe tank top, bursting negative Arab female stereotypes, and showing everyone that there is more to Palestine than slingshots. Betty also reminded viewers that Palestinians are trapped like rats in a cage with little open space to race or even breathe. Next stop on Anthony's culinary crusade is a place near and dear to my heart, Al Rowwad Theatre in Aida Refugee Camp, Bethlehem. When Bourdain asked Abdelfattah AbuSrour, the theater's director, why Palestinians glorify figures associated with violence, Abed informed him that Arab Idol Mohammad Assaf is far more famous than any martyr—including Yasser Arafat—and that art is a powerful form of nonviolent resistance Palestinians embrace. I have been traveling to the Holy Land since the day I was born and I have seen pretty much everything between the river and the sea I am allowed to see. Bourdain showed me parts of Palestine I have been denied access to by Israel. I have always wanted to visit Gaza because it houses a state-of-the-art disability center, the A.M. Qattan Foundations Centre for the Child, located in Gaza City. Try as I may, I have not been able to get permission to cross the Erez checkpoint that separates the Palestinians in Gaza from those in the West Bank. The only other way in is through Rafah, but as a person living with a disability I am unable to handle traveling through the Egyptian/Palestinian border, which is treacherous and more often closed than not. My boy Anthony brought Gaza to me. 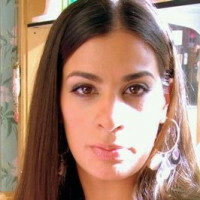 While in Gaza, Bourdain’s host was yet again a woman, Laila El-Haddad, aka the fabulous @gazamom in the Twitterverse. She and Tony chow down on homemade maklouba, a rice, veggie, and meat dish whose name translates to “upside down” because it is all cooked in one pot and flipped upside down to serve. The man who is serving the maklouba flips it on his head. It is must-see TV. While enjoying the maklouba, Anthony gets to experience the typical chaos of a Palestinian home where the kids outnumber the adults. Laila also makes a super important point when she explains to Anthony that their host, maklouba man, is not yelling and that is just the way we talk. This scene made me smile and reminded me of the millions of times I had to explain to friends that my dad was not shouting angrily at me but rather loving on me. After the maklouba, Laila treats Tony to fried watermelon stew. I pride myself on being a connoisseur of Palestinian cuisine, but I have never seen or heard of this fabulous watermelon concoction. I am more determined than ever to get into Gaza just so I can sit on the beach and devour this Bedouin feast with my hands. It is the only way to truly enjoy food, which is why according to Anthony's host, "God gave us hands instead of spoons." Bourdain showed me something else I have never seen: the inside of an Israeli settlement. I may be American but I am not Jewish and my Palestinian self is not welcome in the religiously segregated illegal settlements that dot the West Bank and Jerusalem. They are exactly what I had pictured, typical cookie-cutter gated communities, but with far more weapons and barbed wire. Anyone who takes religious texts literally scares the bejesus out of me and settlers who think they have some divine right to Palestinian farmland also terrify me. During the Settlement segment of Parts Unknown, I heard the most delusional statement of the episode. The chief executive of Illit settlements claimed his presence made his Palestinian neighbors’ lives better. Listening to this man go on about how Palestinians are happy and the settlers gave them prosperity reinforces my belief that settlers are completely disconnected from reality and their own bigotry. Bourdain called BS on his guide, proving yet again that Anthony is one of the best chefs in the news business. Along the way, Bourdain also dines with an Israeli woman and Palestinian man who are married with children. Yes, these couples do exist. They serve up a vegetarian feast. It is easy to go vegan in Palestine, which is where I quit eating food with a face. The vegetables and spices are one of a kind and you don't even miss the meat. The show closes with Anthony visiting an Israeli restaurateur, Natan, who lost his daughter to the violence of the conflict. He is an advocate of dialogue and no fan of the settlements. Natan, who served as an enforcer of the occupation as a soldier in Gaza, speaks of both sides’ senseless loss of life. This is something Parts Unknown managed to showcase beautifully in this episode. Without creating a false sense of equivalency between the oppressed and the oppressor, Tony reminded his audience that both sides love their children and that all violence must cease. Bourdain chooses to end the Jerusalem, West Bank, Gaza episode with a profile that screams for co-existence and tearing down that big, ugly wall that is clearly not a fence. Anthony Bourdain began this edition of Parts Unknown by saying, “By the end of this hour, I’ll be seen by many as a terrorist sympathizer, a Zionist tool, a self-hating Jew, an apologist for American imperialism, an Orientalist, socialist, a fascist, CIA agent, and worse.” It’s like he and I are twins separated at birth, because I get the same reaction every time I pen a piece for Open Zion. Except instead of being called a self-hating Jew I am called a Gumby-mouthed skank. Anthony knew what he was getting into. He went there anyway and delivered groundbreaking reporting, so rarely seen on the news these days, with no reservations and no apologies.